A polynomial equation is an equation that can be written as an equation with 0 on one side and a polynomial on the other, for example 2a + 5 = 0. Polynomials are distinguished in two ways, by the number of terms and its degree. The highest degree of the monomials is 1, so the polynomial 2x + 3x + 4 is of degree 1 and is a trinomial. the number of terms they have. 4x is the highest degree monomial term with a degree of 1, so the polynomial equations degree is 1.
degree of this polynomial equation is 2.
add up to 5, so the degree of this polynomial equation is 5.
polynomial equations of degree 2.
highest to lowest degree from left to right is called standard form. To solve these types of quadratic equations, we need to find 2 numbers p and q such that p+q=b and pq =ac. Two numbers p and q so that pq=2 and p+q=3 are 2 and 1. We factor the quadratic equation so that it is in the form of (kt + r)(st +u) where k, r, s, u are any real numbers. To factor 2t2 +2t+t +1 =0, we group the first two and the last two terms. Either (t+1) = 0 or (2t+1) = 0, so the solutions to the quadratic equation are t = -1 or t = -1/2. represent the value of f(x) for a given value of x. (x2, 0) are points where the graph of f(x) meets the x axis. Hence these roots of the quadratic equation are also called x intercepts. how much time is required to cover a distance of 24 m.
Writing factors of -24, the two factors that satisfy the above condition are -6 and 4. 24 meters in 6 seconds. There are a few identities which are easy to recognize and can be factored easily. You should memorize these. Then it is easy to find the value of x by first finding the square root of both the sides and then solving the linear equation. are given, divide the equation by whatever the coefficient of x2 is first in order to start with the appropriate form. Find the x intercepts of the graph of the function f(x) = x2-6x+7. 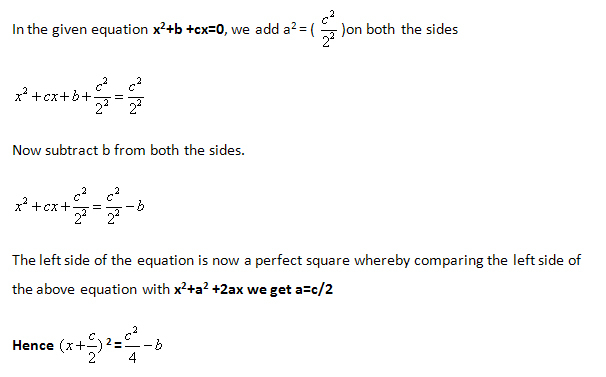 To find the x intercepts, we substitute f(x)= 0.
steps for completing the square mentioned above.